The Aga Khan foundation has trained over 1,000 headteachers of nursery and primary schools from Lindi and Mtwara regions through its project that seeks to improve education in the East Africa Regions (AKU-IED, EA). The free training that involved headteachers from Kilwa, Lindi, Nachingwea and Newala districts had benefited from various training of teaching techniques including how to prepare the relevant subjects. The AKU-IED,EA Project Manager, Mr Ronald Kimambo said the project is well known as 'the project of consolidation of professional and supporting education systems in improving learning outcomes'. This was revealed on Friday during the fourth graduation ceremony since the establishment of the project. "This is a five year project that sponsored by the government of the Canada and the Aga Khan foundation ... and it's expected to complete at the end of this year," Kimambo briefed during the occasion held in Kilwa District. According to him, since the establishment of the project has helped bring positive change among teachers and pupils, as well as strengthen government's efforts in improving the education sector. "We hope these teachers will serve as a springboard for their fellow teachers through knowledge sharing," he said. The main project facilitator, Dr Abdallah Mohamed, said the teachers were taught two courses: Leadership and administration and training, monitoring and assessment of students. He said the courses were taught for six months and provided for three phases, theory, practical and the third is the teachers to meet with trainers to present feedback. At the same occasion, Planning Officer in the Kilwa District, Mr Francis Kaunda has urged the graduates to use the training for building good understanding capacity to the pupils in their schools. "This is the great opportunity to you guys, use it well and we are so dependent on you to share the skills with the teachers who did not benefit from this project," said Kaunda. The Acting Director of Training for the Ministry of Education, Science, Technology and Vocational Training, Basiliana Mrimi urged the graduates to actively use the training in improving education by solving teaching challenges in their areas. One of the graduates, Alfa Milanzi, a headteacher at Madangwa Primary School said the training had helped him get positive change, and that he hopes to perform better in his career than before. "Through these training course I have well understood how to prepare different subject concepts better than before," he said. BRUSSELS, Feb 24 (Reuters) - The following are mergers under review by the European Commission and a brief guide to the EU merger process. The Aga Khan Foundation has bagged an award for implementing a development model that aims at improving access to water and sanitation for marginalised communities across urban and rural areas of the country. The Aga Khan Development Network (AKDN) of the prestigious foundation received the FICCI-India Sanitation Coalition prize for the initiative that seeks to contribute towards building an open-defecation free India by 2019 under the ‘Swachh Bharat’ mission, the Foundation said on Saturday. The Foundation’s CEO, Tinni Sawhney, and other dignitaries from the Aga Khan Rural Support Programme (AKRSP) received the award from Railway Minister Suresh Prabhu on Thursday. “The initiative aims at improving access to water and sanitation for marginalised communities across urban and rural India, including helping 1,00,000 families and 538 schools, as well as building toilets in the States of Bihar, Gujarat, Madhya Pradesh, Telangana and Uttar Pradesh,” the Foundation said. “The model that we have implemented is a collaborative initiative, working in close partnership with the district and the [respective] State government, prioritising a strong behavioural change component to ensure sustained use and maintenance of sanitation facilities,” Ms. Sawhney said. The integrated block-level sanitation model is being piloted in rural Bihar. This blog reflects highlights from a conversation with Sarah Heddon, Program Associate at Aga Khan Foundation. She recently visited Mozambique to oversee MozaCajú, a three-year project implemented jointly by TechnoServe and the Aga Khan Foundation with funding from U.S. Department of Agriculture. The Aga Khan Development Network (AKDN) and its agencies actively seek to co-operate with like-minded institutions in the design, implementation and funding of innovative development projects. They therefore need and welcome institutions and individuals throughout the world as partners to attain shared objectives. Individual AKDN agencies also work closely with local, state and national governments in each country in which they are active. The following institutional partners contributed financially or materially to the programmes of individual AKDN agencies. Many more contributed practically and intellectually to their work. All of these contributions are gratefully acknowledged. In response to these challenges, in 2015, the Aga Khan Foundation began piloting a cocoa value chain initiative in Madagascar's northern Diana region. Its aim is to improve the quality of cocoa and demonstrate to private sector buyers that the Diana region has the potential to become a significant producer of quality cocoa. In doing so, over time this initiative aims to increase exports and, ultimately, raise the incomes for thousands of farmers. Initially, working alongside 125 farmers, the programme is focusing on three key initiatives. works in over 30 countries around the world. The majority of 80000 are based in developing countries. annual budget for non-profit development activities is approximately US$ 925 million. 1.3 million people were provided with clean safe drinking water. All surpluses are reinvested into further development activities. Recalling 60 years of His Highness the Aga Khan's work in realising goals and values of the Ismaili Imamat through the work of the Aga Khan Development Network. The Aga Khan Development Network has vowed to continue funding and supporting both Social and Economic Sectors in Uganda as well as advocating for a pluralistic Society World Over. 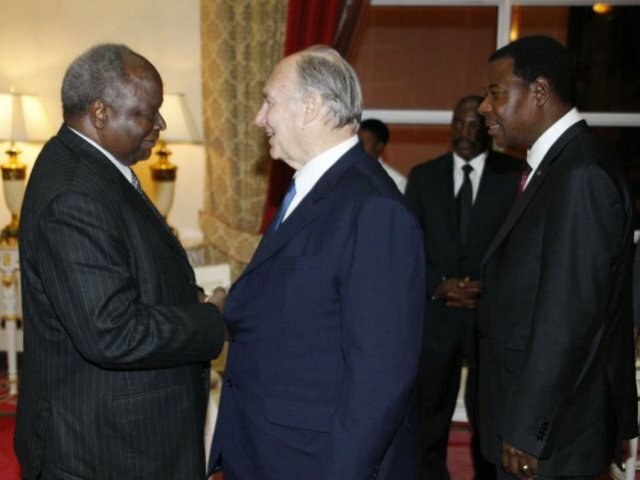 This information was revealed at the Diamond Jubilee Celebrations of His Highness the Aga Khan to mark 60 years since he inherited the title of Imam in 1957. ISLAMABAD, Pakistan: President Mamnoon Hussain on Wednesday said the continued efforts of Aga Khan Development Network (AKDN) through its multiple projects in the country were making a visible difference in the lives of the people and infrastructure. The President expressed these views while talking to President of Aga Khan Council for Pakistan Hafiz Sherali who called on him at the Aiwan-e-Sadr in Islamabad to handover a letter from Prince Karim Aga Khan in response to the President’s letter of felicitation on the diamond jubilee of the former’s Imamat. The President appreciated the role of Aga Khan Development Network (AKDN), Aga Khan Foundation and Aga Khan Health Services role in promoting many important social services projects, especially in northern areas of Pakistan. He said Prince Karim Aga Khan like his grandfather focused his efforts concerning the quality of life of Muslims all around the world. In areas of health, education, cultural, revitalization, and economic empowerment, Prince Karim Aga Khan worked to inspire excellence and improve living condition and opportunities in some of the world’s most remote regions, he added. The President also underlined the role of Aga Khan’s grandfather Sir Sultan Shah Aga Khan in the Pakistan Movement as the first President of All India Muslim League. In his message, acknowledging his family’s strong ties dating back to the foundation of Pakistan, Prince Aga Khan highlighted the long-established collaboration of the AKDN with public and private institutions to improve the quality of life, create opportunity and build a strong and vibrant civil society in the country. He expressed gratitude to the President and the Government of Pakistan for their continued support and partnership which led to a number of pioneering initiatives in the country. Hafiz Sherali apprised the President about AKDN’s recent activities and its focus to alleviate poverty, provide increased access to finance for education, health and housing, early childhood development, and infrastructure (principally, water and energy) projects in developing countries. The President also conveyed best wishes for Prince Karim Aga Khan from the Government and People of Pakistan. The project has been made p;ossible through contribution from Aga Khan Development Network (AKDN). At least 6,000 people living in Mapogolo - Idodi and Itunundu - Ikorongo villages in Iringa Region can now easily get water from wells through solar water pumping systems installed recently. Minister for Lands, Housing and Human Settlements Development, Mr William Lukuvi, who is also MP or Ismani Constituency in Iringa, thanked AKDN and Ismaili community for making the projects a reality. The projects were part of other humanitarian assistance by the Ismaili community this year to commemorate the 60th diamond jubilee celebrations of His Highness, the Aga Khan. AKDN is a non – profit organisation founded and guided by his Aga Khan. For than a century it has been contributing to the social, economic and cultural development in Tanzania, which includes rural support of agricultural programmes, hospitals and health centers, schools and others. The inauguration of the two wells was also attended by Regional and District Commissioners from Iringa and other village council leaders from Mapogolo and Ikorongo villages as well as the Vise President of the Ismaili community in Tanzania and other officials from Ismaili council of southern region. DOHA (Reuters) - Qatar Airways said on Thursday it had acquired a 49 percent stake in AQA Holding, the new parent company of Italy’s Meridiana, adding to its growing portfolio of investments in foreign airlines. Previous sole owner Alisarda retains 51 percent, the major Middle East airline said in a statement. Loss-making, Sardinia-based Meridiana is Italy’s second largest carrier behind Alitalia [CAITLA.UL], which is partly owned by Abu Dhabi’s Etihad Airways. Alitalia filed for administration earlier this year. The value of the Meridiana acquisition was not given, and the deal was finalised after protracted negotiations that formally started more than a year ago. “We are delighted to formalize this important partnership, which will help increase Meridiana’s competitiveness in the European market,” Qatar Airways Chief Executive Akbar al-Baker said. Italian Foreign Minister Angelino Alfano said the deal represented a turnaround for Meridiana and would help Italy’s tourism industry, especially in the poorer south of the country. Transport Minister Graziano Delrio said it would ensure job security for Meridiana workers, and created the potential for future job growth. Alisarda Chairman Marco Rigotti has been appointed chairman of AQA Holding, and Francesco Violante has been appointed as chairman of Meridiana. A new strategy and chief executive for Meridiana would be announced in “due course,” but al-Baker said Qatar Airways would work with Meridiana to improve its connectivity to Italy, other European destinations, and to the United States. Al-Baker has said Meridiana would use Boeing 737 MAXs ordered by Qatar Airways, with 20 to be delivered to the Italian airline from the second quarter of 2018. Meridiana, which offers flights to and from Sardinia and other destinations in Italy, was until now fully owned by the Aga Khan, a businessman and spiritual leader of the Ismaili Muslims. Qatar Airways bought the Meridiana stake nearly four months into a Gulf political crisis that has seen some Arab states cut ties with Qatar, and the airline banned from flying to some Middle East cities. Qatar Airways also owns minority stakes in British Airways parent International Airlines Group (IAG) and South America’s LATAM Airlines. Earlier this year, Qatar Airways tried to add American Airlines (AAL.O) to its portfolio of minority stakes but later backed away after being rebuked by American’s management. It has also expressed interest in Royal Air Maroc [RAM.UL]. Qatar Airways has said it buys stakes in airlines that it believes are good investments, and lets them operate as businesses distinct from the Gulf carrier. Dar es Salaam. Tanzania’s budding entrepreneurs have been challenged to come up with apt business plans in a bid to secure sufficient grants from donors, which will help them run their businesses efficiently. This was said by Prof Honest Ngowi of the Mzumbe University when addressing participants of the National Tanzania Scale Forum yesterday. The forum carried the theme “Young Entrepreneurship for Social Impact”. Besides Prof Ngowi called on financial institutions to support the young entrepreneurs by providing them with soft loans or grants to enable them to grow their businesses. The National Tanzania Scale Forum, which was organised by the Aga Khan Development Network Agencies (Aga Khan University and Aga Khan Foundation), brought together over 100 young entrepreneurs from across the country to discuss and share experience in entrepreneurship. For his part, the Director of East Africa Institute of Aga Khan University, Mr Alex Awiti said the programme was crucial because it provided the young entrepreneurs with the skills and experience about entrepreneurship. To understand the impact of the Aga Khan Foundation (AKF), one has to look at specific programmes. The foundation has improved the lives of many people on Kenya’s ocean coast for example. In Mombasa and the neighbouring counties of Kilifi and Kwale, the AKF has been engaged in pre-primary and primary education for almost four decades. Several million dollars have been spent, and various partners, including the Canadian government, have been involved. In 1982, the Aga Khan visited Mombasa, where he met Muslim leaders. They told him there was a need to improve childhood education. The situation was dire in Mombasa, because fewer Muslim children than Christian children went to primary and secondary schools, and the performance of those that did was not as good as their counterparts’ performance in the Christian schools. The parents knew that the problem began very early. Due to shaky foundations built in their children’s early years, it was not a surprise that they failed their primary and secondary school exams. It certainly could make it to university. Because they failed in formal education, their fate was to be stuck in the vicious cycle of ignorance, illiteracy and poverty. In 1983, researchers confirmed this view. According to their study, “quality pre-school education for three-to-six year-olds was critical to their future development”. The AKF became involved. In the meantime, more than 250,000 children have benefited from the programme. Not all of them were Muslims. The AKF does not promote sectarian approaches but spreads the message of communities living peacefully together. On the Kenyan coast, the AKF also has a history of improving food security. Its rural support programme started out with model projects in three of the region’s poorest sub-counties. According to an AKF official, the places concerned “face harsh climatic conditions, are geographically remote and generally have low access to government services”. Many residents still lack access to clean drinking water, infrastructure is poor, and there is limited access to education and health care. Over a 15-year period, the programme has grown from four village organisation to 195, with over 230,000 members. The AKF reports that the programme helped to build 121 dams and small farm reservoirs that provide access to water for domestic and productive use in the target communities. As a result, many households were able to increase their agricultural production and incomes. The programme also helped to improve access to water, sanitation and hygiene in 50 schools for 30,000 children. Another achievement is that 24,000 community members now rely on 47 kilometres of water pipes. Families were encouraged to establish kitchen gardens for improved nutrition. Moreover, 250,000 trees were planted. The foundation says it has trained over 200,000 Kenyan farmers on how to increase their productivity. Such numbers are impressive. In rural Tanzania, the AKF is taking a similar approach. The target group is smallholder farmers in the remote Lindi and Mtwara regions, which are near the Mozambican border. “The programme supports multiple economic activities that improve agricultural production by mainly enhancing productivity and educating farmers on better marketing practices,” the AKF spokesperson reports. “Its key focus has been on the rice and sesame value chains, as well as on increasing access to financial services through community-based savings groups.” The savings groups allow households to pool their funds and take small loans. The list of countries where Aga Khan institutions operate features countries where life is hard, poverty is dire and more help is needed. Because of the institutions’ excellent reputation, other development agencies appreciate cooperating with them. In a grainy video from 1957, a man of 20 years age is escorted to the throne, crowned and made the leader of what today is a vast community of an estimated 20 million Ismailis, a branch of Shia Islam. The youngster went up to the throne as Prince Karim al Husseini Shah and came down as His Highness the Aga Khan IV. He is an unusual monarch in the sense of not having a geographic realm. His personal fortune is kept secret. Forbes esti­mated it at $ 800 million in 2010. Today, his nationality is British, his background is South Asian and he lives in France. Passed on to his young shoulders in 1957, was not just a title but also a ton of responsibilities that were initially defined by his grandfather. Today, the impact of his tenure and his work dots every sector of society in nearly 30 countries. The Aga Khan Development Network (AKDN) and the Aga Khan Foundation (AKF) are important institutions. They are difficult to describe in one word or one sentence. Philanthropy doesn’t quite fit, nor does entrepreneurship. Social enterprise comes close. The Aga Khan frowns upon such framing because it doesn’t tell the whole story. AKF Digital Savings Groups are groups of 15-30 members who operate a savings group over a nine-month to one-year cycle on average, just as CBSGs have always done. However, DSGs are entirely cashless and paperless, while maintaining the social aspect. First, that the rise globally of political and economic uncertainties has invited conflicting expectations of the role of education, and second that the world crisis in education has produced uncertainty about the meaning of learning and conflicting perspectives about where we learn, what we learn, when we learn, and how we learn. We believe that now, more than ever, there is a critical need to reconsider the debates about the role of education and the meaning of learning in an uncertain world. We must think again about the shape of the institutional frameworks in which education is given and interrogate more robustly the discourse that seeks to define education – as being of good quality or not, inclusive or not, effective or not. And that it is right to explore the tensions between the efforts that value the development of open-mindedness, of intercultural understanding and of comfort with diversity, and those that look towards education to retract in favour of singularity, of certainty and of definitive standards, at a time when the debate on this is at its most heightened. The research programme in its inaugural year intends to inspire new conversations, scholarly papers, and empirical studies about the role of education and the nature and meaning of learning in a world in flux. Images from around the world help tell the stories of how people are working to help improve the quality of life for millions of people in partnership with AKDN. Over the last year, partners and friends have submitted photographs from around the globe. As we mark the Diamond Jubilee of His Highness the Aga Khan, we have brought together a collection of 60 of the most-shared pictures from AKDN projects around the world. From an inside look at economic empowerment programs for women in Central Asia, to flying broomsticks in Naryn, Kyrgyz Republic, to the restoration and conservation of buildings in India and Pakistan, to stories of collaboration and service in the U.S. and Canada, here are some highlights of people working to make a difference. Thank you to all our partners, staff, volunteers and friends who are part of this story of positive impact around the world. India, 24 April 2017 - An integrated block-level sanitation model is being piloted in rural Bihar, India. The approach focuses on community-led initiatives for ensuring universal sanitation coverage at the village and block level, real time tracking of household sanitation coverage, monitoring improvements in key hygiene behaviours using a mobile-based app, and strengthening the sanitation supply chain through training of masons, including making available required materials for toilet construction. AKDN activities span the states of Andhra Pradesh, Bihar, Delhi, Gujarat, Madhya Pradesh, Maharashtra, Rajasthan, Telangana and Uttar Pradesh. They address a spectrum of development issues ranging from cultural restoration to education, financial inclusion to healthcare, agriculture and environment to civil society strengthening. These initiatives include schools and educational centres, a 162-bed multi-specialty acute care hospital in Mumbai, a rural support programme that has benefited over 1.5 million people in six Indian states and the restoration of a World Heritage site in the nation’s capital. ARUA, Uganda--Feta James Harold is eight years old pupil of Rigbo Primary school in Arua district. He is in Primary two. The school is a rural area near the river Nile North east of Arua town. His father is the deputy head teacher and a class teacher of P2 in the school. He likes drawing things on sand and naming them thereafter shows the teacher his work on the ground but this was in the past. When the computer/tablets were brought to the school by Aga Khan Foundation (AKF) this boy developed an interest in learning how to use them. As a result when ever his father holds the laptop he comes besides him to see what the father was doing. In the process of being close to the laptop, the boy has developed skills of navigating the digital stories, games and quizzes installed in the laptop and tablets to the extent that he now assists/ trains and guide his peers whenever they face challenges in class. Some of the unique skills he has acquired include; locating stories, navigating between stories, doing quizzes, dragging and tracing among others. He has become a champion pupil in the school. He has picked up reading very well as such his elder brother Desire Hannington who is in P4 is learning reading Lugbarati and English from him. Feta said ; “I want to become a pilot because one of the stories in the laptop talked about a girl who was a pilot” His father said the presence of the computer had accelerated his learning in spellings, reading, drawing, reasoning, peer interaction and speaking. Thanks to Aga Khan Foundation. The Aga Khan Foundation (AKF) Tanzania with support from the European Union (EU) on Thursday launched a Tsh 4.1bn rice project in Morogoro Region, Tanzania. Working with the Rice Council of Tanzania (RCT), the four-year project is dubbed ‘Enhancing Competitiveness of Smallholder Rice Farmers in Morogoro’ and aims to strengthen the capacity of smallholder farmers and value chain actors in the rice sector. The EU has funded the project in support of the Southern Agricultural Growth Corridor of Tanzania (SAGCOT)’s goal of fostering inclusive, commercially successful agribusiness. “Smallholder farmers will be enabled to produce a product that is of good quality and in sufficient volume at a lower cost of production,” he added. The project facilitates collective marketing through farmers groups’ to ensure that trading is fair. It further adds entities to work with millers and buyers to improve milling, grading, packaging, branding and marketing of rice. The initiative will also work on raising awareness on standards and policies as well as promote learning and policy improvement in the rice value chain. KAMPALA, UGANDA- The Aga Khan Foundation and Kampala City Council Authority have signed a Memorandum Of Understanding (MoU) for the implementation of a project intended to improve the wellbeing of boys and girls aged 0-8 in Central Uganda. The two and half year project is geared towards improving care practices including cognitive stimulation and nutrition, among caregivers of boys and girls aged 0-3 years, strengthening capacity of caregivers to support primary school readiness for boys and girls aged 3-5 years, increasing capacity of primary schools to support successful transition and retention of children aged 6-8years and enhancing learning and coordination between ECD service providers within KCCA. The signing event was attended by the Aga Khan Foundation team led by Dr. Akim Okuni and the KCCA team was led by Juliet Namudu, Director Legal, Acting Deputy Director Public and Corporate affairs Peter Kawuju and Deputy Director Social Services. Juliet Namudu the Acting Deputy Executive Director of KCCA said “Today we are here to sign an MOU with the Aga Khan Foundation to look after the children form the age of 0 to 8 years of age in several ways of health and nutrition plus preparing them for education at the lower level, the hops is that this intervention will keep the children in school longer. We are very thankful to the Aga Khan Foundation for choosing KCCA to work with us in the aspects of health and education. We look forward to a very good partnership where we are going to make a difference in the life of our children”. Dr. Akim Okuni the Country Director of the Aga Khan Foundation noted that “Early Childhood development in Uganda is characterized by limited access, I thinks it’s between 12% to 15% of the children in Uganda who access Early Childhood education in a formal context, the other is that they are generally poor services and inadequate coordination between service providers in addition to lack of capacity of human resource, so this project in the districts where we shall be implementing this project including KCCA our intension is to tackle some of these issues.”. Aga Khan Foundation launches Ksh117 million project in Kisii County. Expectant mothers, newborns and children under five years in Kisii County are set to benefit from a KShs.117million Maternal and Child Health project. On March 21, Kisii Deputy Governor Joash Maangi laid the foundation stone for a new maternal and child health block and a theatre at Kenyenya Sub County Hospital in Bomachoge Borabu. The project funded by the Aga Khan Development Network and dubbed ‘Access to Quality Care through Extending and Strengthening Health Systems (AQCESS)’ will significantly boost availability, quality and utilization of essential services for expectant mothers, newborns and children under five. The four-year project whose implementation began in 2016 will also benefit 10 community units through improvement of facilities and capacity building for health workers. LAHORE: The Jubilee Insurance Cup 2018 is set to spark excitement among our cricket loving nation with the T20 cricket series just around the corner. Jubilee Life, Pakistan’s largest life insurance provider in the private sector is the title sponsor of this upcoming event being played between Pakistan and West Indies. This comes following the much applauded Pakistan Super League (PSL) series with the final being gloriously concluded in Karachi. The Jubilee Insurance Cup 2018 to is scheduled for 3 T20 matches from April 01 to April 03, 2018 at the National Stadium, Karachi. This announcement was made during a press conference held in Lahore. The Aga Khan Foundation yesterday handed over Sh3.5 million equipment to the Garissa vocational training centre. The equipment — including sewing machines, fabric, electrical and beauty therapy products — were received on behalf of the institution by area deputy Abdi Dagane. Hasma Awadh of the Aga Khan Foundation said the equipment were purchased by funds they received from the EU. She said the three-year project will improve the socio-economic opportunities for youth in Northern Kenya. Dagane said youth enrolment to the centre was still low despite the county’s support. The government set aside more than Sh2 billion for the 47 counties. It will fund student capitation of Sh15,000 each for tuition, training materials, skills completion and co-curricular activities. The Aga Khan foundation has donated equipment worth 3.5 million shillings to the Garissa vocational training centre. The equipment which included tailoring machines, materials, electrical and beauty therapy products were received on behalf of the institution by area Deputy Governor Abdi Dagane. The donation is part of a 3 year project meant to improve the socio-economic opportunities for the youth in Northern Kenya. Rising unemployment among the youth in Northern Kenya has been described as a time bomb waiting to happen, a state of affairs that also makes them a soft target for recruitment by gangs and terrorists. It’s probably informed by this that various stakeholders are coming up with projects to create opportunities for the youth in the area. Hasma Awadh of Aga Khan Foundation said the 3.5 million shillings equipment were purchased by funds they received from the European Union saying this will be a 3 year project meant to improve the socio-economic opportunities for the youth in Northern Kenya. Deputy Governor Abdi Dagane reiterated that the county government was committed to ensuring that institutions that provide skills and opportunities to the youth are well funded. He however expressed disappointment that the enrollment especially by the local youth was still low. He urged the members of the county assembly to help in a campaign to encourage the local youth to enroll adding that learning was free. Elijah Mwaniki, director of vocational education training said the department is revising the current curriculum to ensure that the skills the youth acquire can also allow them work in modern industries apart from being self-reliant.